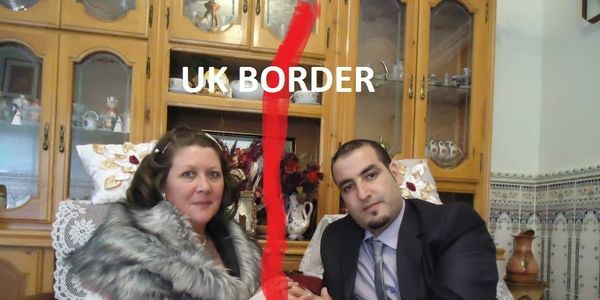 petition: Tell UK to give this couple rights to a married life. Tell UK to give this couple rights to a married life. recipient: UK border agency and home office. Yazid, sometimes I don't tell you how truly wonderful you really are. What a passionate & caring soul you have, & how much you have done for me. When I was so low & lost how patient you have been with me. How can I say what it feels like to have someone hold out a hand to pull you from a dark pit into the light? To make me feel like living again, to let me breathe, to cry, to pity myself, without any judgement. To always be there for me, telling me that I am worthy of love, and to make me feel loved every day. To care for me, to want me to be whole not in pieces. You never make me feel small, or accuse me, or take from me more than I offer to give. You ask for nothing, never complain and I feel so lucky to be with you, to feel you, to share with you everything that I am.I love you more each day, every hour that passes, each moment, as my heart grows stronger with your love. I wish I was the dream, the world, the universe that you carry inside your heart, as this is the most beautiful heaven. I want nothing more than for you to be in my life, in my arms, and for us to carry on sharing our dreams & plans, as faith is everything and in faith all things are possible and can come true.You are the sunshine that I need to feel alive, to give me energy and to bathe me in warmth. I could never hope for what you have brought to my life, and this is why my hope died, as I no longer need this hope in life, now that i have you beside me. I no longer need to wish for happiness, as you bring this to me everyday, no matter what the circumstances. I am truly in awe of you and grateful for all that you have done, my crazy wolf, you never give up, you are tireless and fearless and worthy of all that is great. I know most of you my friends been witnesses of my relationship with my wife Angel Selmani we always shared our love and relationship development online and in real life with all the pictures we post about us and share it with all friend without secrets we declare our relationship statu publically because we are real genuine couple with real love and caring thoughts about everyone and all beings. I know most will recognize us and sign and share this petition to help us to be together and make our dreams come true. Blessing for all of you and all the caring souls who will sign and share this. LOVE, LIGHT & PEACE FOR EVERYONE.